According to Merriam-Webster’s dictionary, ‘holistic’ means “relating to or concerned with complete systems rather than with individual parts.” We understand that when we’re talking about medicine, a ‘holistic’ approach means to treat both the mind and the body. Have you ever thought about taking a ‘holistic’ approach to employee engagement when it comes to providing incentives? Many companies see the benefit of implementing an incentive program to motivate their top performers. Incentive travel programs, specifically, are effective when targeting top salespeople or most loyal customers because they are in a position to generate sales or revenue to earn the reward. And the revenues they generate are substantial enough to fund the program. But what impact does incentivizing the top echelon have on others in the organization who are either the middle performers who are unlikely to achieve the goals or in another department altogether and not even eligible? A more ‘holistic’ approach to the engagement would mean implementing incentive programs that address the entire population or employees or customers, not just certain individual parts. There are ways to offer incentives to every single person in your company. Even if a middle manager can’t quality for a trip to the Caribbean, they could secure enough points over time to go to a nearby city for a long weekend or choose a new I-Pad. Even at the entry level, performance can be enhanced by the promise of gift cards. For more information on engaging all of your employees and customers in achieving better performance, contact Colin Higgins at colin@peincentives.com or call 978-287-9500. 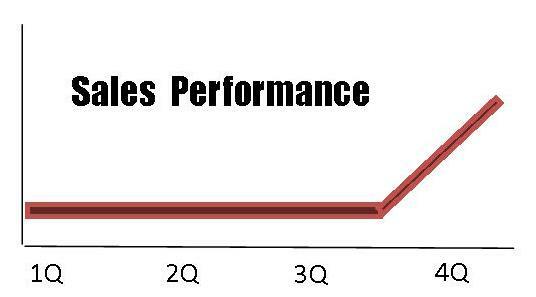 I’ve heard man y sales or business leaders complain that the chart of their sales during the course of the qualifying period of an incentive program resembles a hockey stick. And not a strong, upright stick that’s ready for play, but one that’s lying on the ground, flat, with only the blade of the stick pointing skyward. How does this happen? Oftentimes even the best salespeople take it easy or channel partners divert business elsewhere until the deadline to achieve an incentive sales award is looming. Then they focus and the sales come in. Wouldn’t you prefer a better effort all year long? 1) Design a program that offers bonus points when certain levels of sales are realized by certain dates during the contest period. 2) Provide an extra incentive if the total sales goal is achieved prior to the end of the contest. 3) Assign extra incentives to certain products. Work with a manufacturer to subsidize the cost of the additional reward that is associated with their product. 4) Build in a “quick start contest” which rewards early successes. 5) Reward consistency. For instance, put some rules in place that would encourage a certain level of sales for consecutive months. Remember, customers who buy early, have the opportunity to buy more during the contest period. If you don’t encourage sales earlier in the game, you are leaving revenues on the table. For more inspired ideas on designing the right incentive reward program for your team, contact Colin Higgins at colin@peincentives.com or (978) 287-9500.